MUST SEE 3D VIRTUAL TOUR! Southern Living at it&apos;s FINEST! Centennial home! Beautiful foyer, formal living/office. Amazing open gourmet kitchen overlooking breakfast room & great room. Butlers pantry leading into formal dining room. Great room features fireplace and surround sound system. 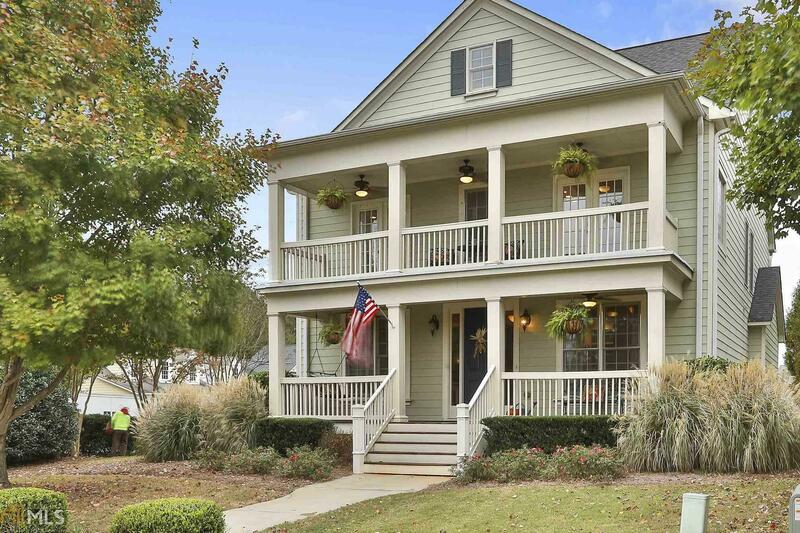 Double front porches & rear deck provide incredible outdoor living. Large deck connects to carriage house with loads of unfinished storage area or future finished living space/guest house. Lg owners suite, spa bath w/french doors opening to upper porch! 2 secondary bedrooms, full bath, rec room, and laundry room complete the second level. Third level offers bedroom/bonus and full bath. Site finished hardwood floors. Custom throughout. McIntosh school district! Walk to shops! Directions: I-85s Exit 61 Peachtree City/Fairburn, Lt On Hwy 74s Approx 10 Mi, Rt Hwy 54, 3rd Light Rt McDuff Pkwy, Past Stop Signs, Rt Into Centennial, Circle The Square. Last House On Right. Copyright 2019 Georgia MLS. All rights reserved. Information deemed reliable but is not guaranteed. The data relating to real estate for sale on this web site comes in part from the Broker Reciprocity Program of Georgia MLS. Real estate listings held by brokerage firms other than Harry Norman Realtors are marked with the Broker Reciprocity logo and detailed information about them includes the name of the listing broker. Information provided is for consumer\'s personal, non-commercial use and may not be used for any purpose other than to identify prospective properties consumers may be interested in purchasing. Harry Norman Realtors does not display the entire MLS database on this website. The listings of some real estate brokerage firms have been excluded. This site will be monitored for \'scraping\' and any use of search facilities of data on the site other than by a consumer looking to purchase real estate, is prohibited. Listing broker has attempted to offer accurate data, but buyers are advised to confirm all items. Information last updated on 2019-04-25.